For most people, the thought of hitting the shops on Christmas Eve fills them with dread. 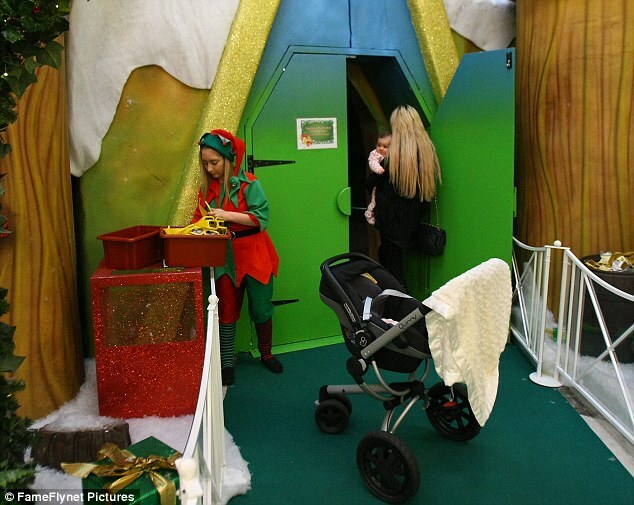 But Chantelle Houghton decided to ignore the warnings and take her baby daughter Dolly to meet Santa Claus at Lakeside Shopping Centre in Thurrock, Essex. The 29-year-old reality star gazed adoringly at her little girl as she treated her to a trip to the grotto, where she is said to have promptly burst into tears upon seeing Dolly on Santa’s knee. Before heading inside to the grotto, Chantelle held her little girl, who was wearing a pink polkadot all-in-one, close and showed her the festive additions at the sight. And Dolly, whose father is Chantelle’s ex-fiancé Alex Reid, appeared slightly overwhelmed, with a bemused look on her face as she took in her surroundings. After leaving the grotto, carrying a present given to Dolly by Santa, Chantelle made her way around the packed shopping centre to pick up her last few gifts. The former Celebrity Big Brother star dressed down in an all-black outfit consisting of leggings, boots and a leather-look top with a black cardigan over the top. Chantelle left her long blonde hair loose apart from pinning her fringe back, and went for a glamorous look with her make-up with red lipstick, nails and fake eyelashes. This Christmas marks Dolly’s first, and will be celebrated without her father Alex – following his less than amicable split from Chantelle and their acrimonious war of words ever since. But speaking in a recent interview, Chantelle said she is going to do her best not to let the situation get her down, and wants to make the holidays as special as possible for little Dolly. Chantelle also spoke of her sadness that she wouldn’t be getting an eternity ring for Christmas from Alex as a sign of commitment following Dolly’s birth. Chantelle’s comments came after Alex spoke of his dream of waking up with Dolly on Christmas morning during an interview with Jeremy Kyle.